I came to Overman King Gainer as a Yoshiyuki Tomino (Mobile Suit Gundam, for those whom the name on its own means nothing) show by way of Gundam Reconguista in G, a show which – as you may or may not recall – I rather liked. While my overall experience with Tomino is limited compared to the overall scope of his oeuvre, with G-Reco and Turn A Gundam (which made my top shows list at #8) under my belt I felt that I had found some kind of kinship, albeit exploratory, with the legendary creator’s idiosyncratic tendencies. And with King Gainer being catalogued along with G-Reco and Turn A among the “Happy Tomino” shows, it only seemed right that I also give it a try. King! King! 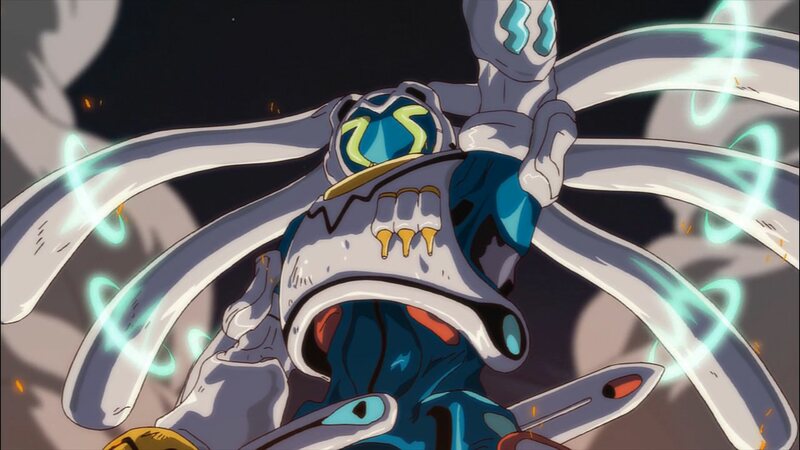 King Gainer! Metal Overman King Gainer! Metal fire! I love you! Metal full coat! 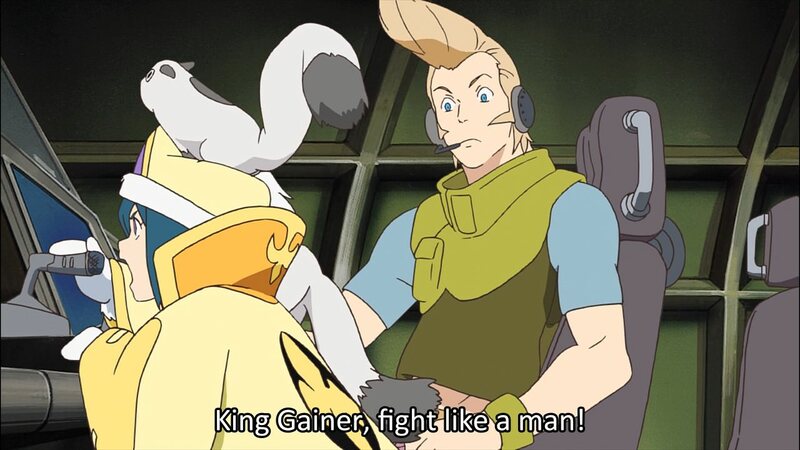 [In background as other lyrics happen]: King, King, King Gainer! King, King, King Gainer! King, King, King Gainer! Did you know you can do the monkey to the rhythm of that “King, King, King Gainer!” chant? Well, you can. Many of the characters do it in the opening, with the mecha joining in (thank you, Kenichi Yoshida). Tomino himself was caught on video during the production of King Gainer doing what looks suspiciously like that dance, too. 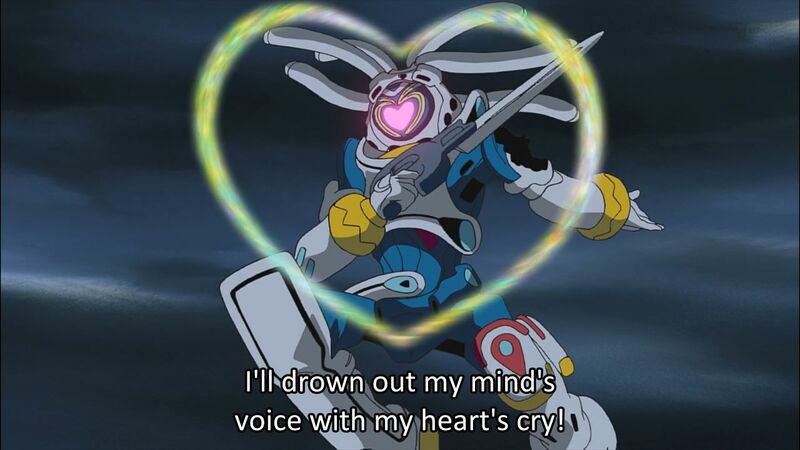 That is the kind of bubbling, enthusiastic energy that King Gainer is imbued with from start to finish. And, in gratefulness for having been able experience all of that for myself, I’d like to highlight just a few of Overman King Gainer‘s merits to hopefully induce a few others to give it a shot sometime. Tomino’s propensity for incorporating the, er, derpier side of martial conflicts into his works is an aspect of his anime that I’ve developed a particular fondness for. While I fond myself rather thrown by the frequent disfunction of the war in Turn A Gundam in my first encounter with Tomino, I came to appreciate it more and more as I completed the series, rewatched it, and then saw G-Reco and Mobile Suit Gundam. 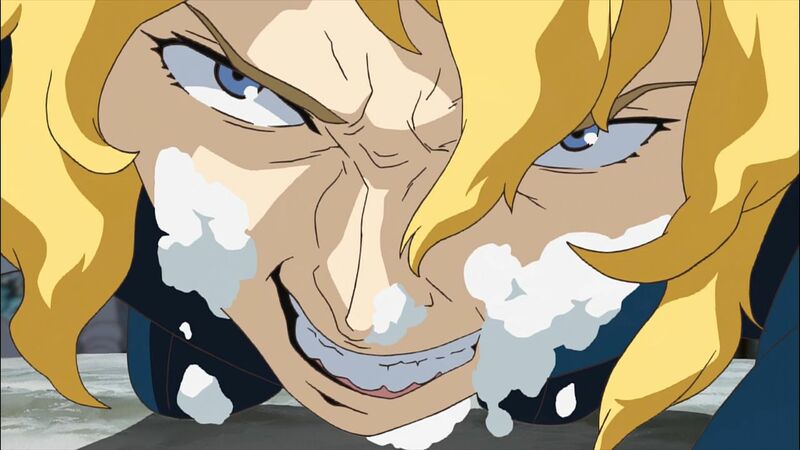 However, I think it’s fair to say that only G-Reco comes close to rivaling Overman King Gainer‘s silliness—and even then, it’s not quite there. There is a pleasant matter-of-factness to the way Tomino anime deliver their absurdities, a kind of grinning deadpan that accompanies the obviously silly moments and more obtuse humorous bits alike. At one point, a stuffed elephant is used as a shield against a throwing knife and is subsequently apologized to upon request. Later on in the series, a confession of love is used to counteract an antagonist’s mind-reading weapon and winds up being broadcast around the globe. In between, a squirrel saves two humans from drowning. And, throughout, people just kinda… say a lot of stuff. Some of which makes sense. Some of which also makes sense, but also is funny. Some of which is just funny. I did not say that Overman King Gainer was not a dumb anime. 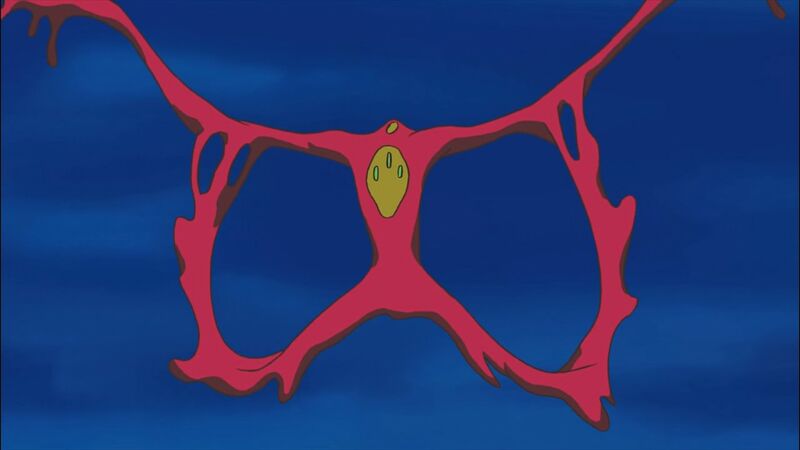 But it sure has a lot of fun with its ridiculous ideas, and the natural way it plays its silliest ones against its more serious ones makes for a unique charm that’s just not like anything else in anime. It’s hard not to like many of the characters in Overman King Gainer. I mean, sure, evil railway boss Kids Munt has an incredibly punchable face (spoilers: this happens, satisfyingly) and Asuham Boone is an unreasonable human being (but he’s also so bad at doing anything that you can’t hate him). But beyond them and a handful of other antagonist-types, the cast of Overman King Gainer is just a pile of delightfully varied and unique personalities. I could list out pretty much all of them and have something good to say about each, but I won’t. Instead, I’ll just note that my favorite in a close race was the precocious young Princess Ana and her trio of squirrel-like creatures, who enthusiastically becomes a hostage for the main group and provides occasional childish verbal beatdowns and plenty of danger-unaware cuteness. Shoutouts to candy-popping genius Overman pilot Cynthia Lane, the witty and good-looking Gain Bijou, the rock-solid Sara Kodama, and the aforementioned Asuham Boone. What speaks even more to King Gainer‘s virtues in this area, though, is the way people in King Gainer are always bouncing around outside their established social circles, talking to each other and generally being a lot of fun to watch. Pretty much the entire cast has chemistry with each other, which, along with the qualities of their unique characters, means conversations are fun no matter who’s participating. On a related note, one aspect of Tomino’s creations that doesn’t get talked about enough is his ability to build a sense of genuine affection and camaraderie amongst the makeshift families that so often form the emotional core of his shows. Whether it’s the crew of the White Base in the original Mobile Suit Gundam or the Bellri-Aida-Raraiya-Noredo quartet in G-Reco, Tomino has a knack for investing you in the bonds between these characters as they meet, get to know each other, grow closer, and go through their stories together. The way Gainer and Sara become pseudo-parents to Cynthia Lane in the series’ final quarter or so is a microcosm of this in action in Overman King Gainer, as the whole Yapan Exodus team moves from being a scattering of individuals and smaller groups into a united effort to bring the Ceilings safely to their home. There is a lot that can be said in favor of the giant roboting in Overman King Gainer. The first is that frankly embarrassing number of fun mecha designs is off the charts – all the way from the likable design of the titular mech, to the rubbery morphing of Cynthia Lane’s Dominator, to weird frog-like Overman, to uncomfortably muscle-bound ones, to the many goofy Silhouette Machine designs, and so forth. 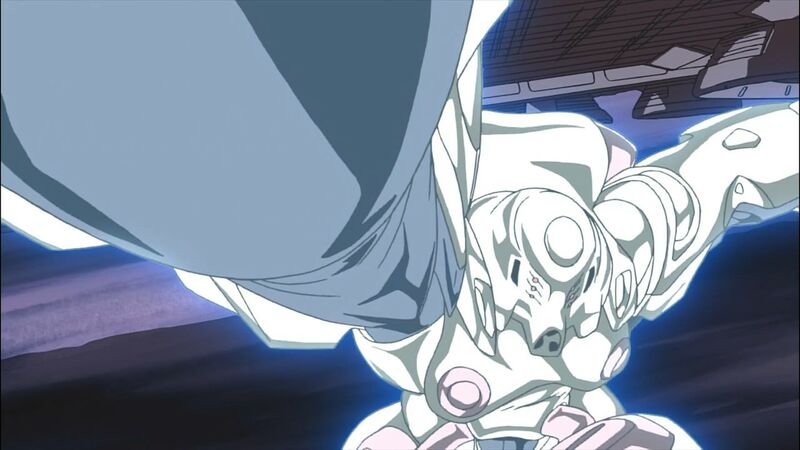 The creativity of the powers the mechs possess—speed, invisibility, gravity control, summoning giant toads, Precure villain powers, causing eternal winter across the planet, etc.—match the designs stride-for-stride. Of course, concepts are nice, but what about the actual use of said giant robots? Well, on the whole, I would argue that King Gainer is better at giant roboting than G-Reco, as it roughly takes a mecha of the week structure, resulting in constant giant robot duels. Happily, King Gainer‘s production is such that it’s able to make those duels achieve frequent visual heights with plenty of exciting animation. The clear standout is the BONES-outsourced episode #14, which was an industry event of sorts, but the majority of King Gainer‘s fights have at least some kind of animation merit to them—whether it be longer fight sequences or just beautifully rendered explosions. But the most important thing about King Gainer‘s giant roboting is simply that it loves the stuff. The mecha of the week format isn’t just a convenient episode structure here, it’s a chance for the show to do what it does best of all – deliver exciting, blood-pumping mecha action to the viewer. All the good designs and fun powers and sakuga are in service of that one goal: to let giant robots do their giant robot thing. The creative of concept simply bubbles out in a joyful rush as the fights get bigger, the opposing mecha more hilariously overpowered, and the titular mecha finding new ways to overcome the challenges before – all the way to the very end, which is one of the most stirring giant robot moments I have yet has the pleasure of witnessing. And you know, this is a giant robot show—so if the giant roboting is good, what else really is there to complain about? I was a pretty big fan of the characters and all their lovely quirks here, even though I felt the overall plot could have continued for a few more episodes after the ending point. Still, it’s not exactly an unsatisfying resolution on an emotional level. The final sequence was quite charming as a matter of fact. Overall, it was a fun ride. That said, I do think shows like the original Gundam, Turn A and even King Gainer were still different from Reconguista, in that it wasn’t Tomino himself being fully in control. He obviously had a lot of input in all cases, especially knowing just how particular the man can be about certain details, but based on how hard it was for people to get into G-Reco and everything about the infamous Dunbine spin-offs there is a case to be made that perhaps the best Tomino works tend to have him as the idea man rather than as the main executive force, so to speak. Yes, good point. G-Reco being pure, unfiltered Tomino perhaps bears witness to how much he’s helped as a creator when there are other people to filter his stuff and make it more approachable and accessible. Now it’s time for Brain Powerd. If you say so, Hag! Well not seeeeriously, though I do like it quite a lot. It has that thing where the characters say a lot of stuff but it’s quite obviously wrong or irrational, reactive stuff, like how 0079 and Zeta have Amuro and Kamille blaming adults and society but also showing sympathetic older characters on both sides, for example. I think Tomino really enjoys the whole “crowded marketplace of ideals” aspect in his work where every character’s got an opinion. Aside from that, I think it’s interesting on its own because it reinterprets mecha as living alien beings that are learning from humanity, so you get nice stuff like friendship but also worrying things like self-sacrifice and anger and so on. Some really nice visuals, music and designs and it gets really into pseudoscientific Gaia Hypothesis-tier stuff. I don’t really recommend it because I think it’s quite a niche taste show, though. I feel compelled to raise this question since it actually relates to my username and avatar, but does Tomino just really like squirrel-like creatures as sidekicks? Because this isn’t the only show of his where one of the characters is followed by one. Granted, having one in King Gainer is far more appropriate tone-wise than it was Ideon, but it seems like a very Tomino thing for that goofy concept to have originated in one of his more dour shows. 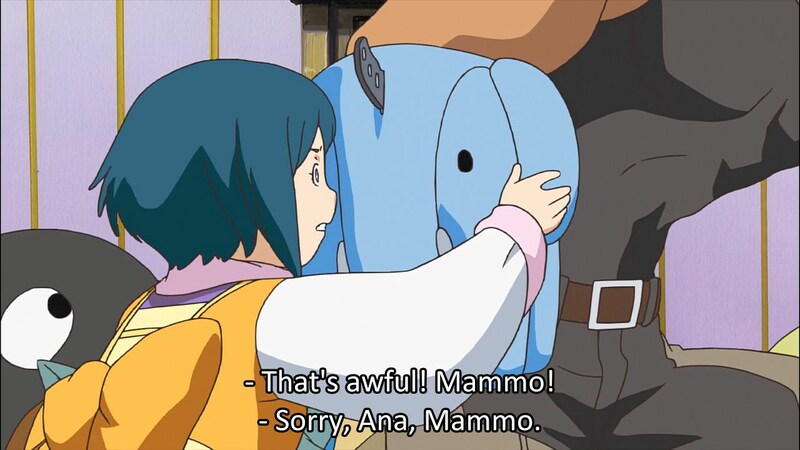 Well, Tomino does really seem to like including animals in his mecha shows – every single one of his that I’ve seen has featured animals at some point (not necessarily in savior roles, though), so my guess is that the squirrel recurrence is mere coincidence.